Shima actually began his career as an actor. His first mainstream apperance was in a drama entitled "akane san no obentou". That same year he released his debut single. 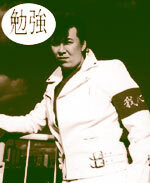 However he really took off in 1982, when he released "otoko no kunshou". This song was featured in the 2004 drama "kisarazu Cat's Eye", and it's popularity began anew. Even now, Shima is the image of what it means to be a man to many older Japanese people. His group is somewhat "yankii", or rebellious (think in the old biker sense), and somewhat similar to that of currently popular group Kishidan.